...at Perfect Sound Forever. This column deals with "listening through," or dealing with artifacts in recordings and being able to hear through to the music. Enjoy it here! Mixed voice orchestrations in classical music, where the sections of performers are deconstructed so that no two common instruments are placed next to each other, offer a unique and entertaining new perspective on familiar pieces of music. With this wonderful new recording from the TrondheimSolistene string ensemble from Norway, both Tchaikovsky's Serenade for Strings in C and Nielsen's Suite for String Orchestra are presented in an entirely new light that makes them sound fresh and adventurous and very, very different. Using very hi-rez files for the direct metal 180g LP master--how does 352.8kHz and 24 bits grab you?--Norwegian record label 2L has presented one of the most fascinating and noteworthy releases of 2012, as well as the last decade. Classical recording techniques in the 21st century are very much alive, and Morten Lindberg--the producer, recording engineer, editor, mixer and mastering engineer of this recording--is very much at the forefront. There's so much to talk about here in terms of the overall result. First, the mixed voice format delivers a sound that is so balanced and even throughout the soundstage that it sounds a lot like a stellar mono recording--you know, one of those records where you can't quite believe it's mono because everything sounds so fluid and realistic and all of the timbres are so perfectly realized. Soundstage width is the first tip-off that this is a stereo recording, and where the comparisons to mono come to an abrupt halt. While the TrondheimSolistene--which translates to "Trondheim Soloists"--is considered a small string orchestra, its overall sound is big and impressively dynamic. Outside of these distinctions, however, it's amazing how utterly even the delivery of musical portions are and how they seem to come from the entire stage at once. You won't hear individual sections of instruments "dance" all over the stage, which I guess would mute counterpoint with specific types of music. The Tchaikovsky and Nielsen pieces are ideally suited to this format, however, with powerful massed sounds driving toward the listener with more force than ever before. For instance, I am very familiar with the Tchaikovsky piece, yet for some reason I was full minute or two into the performance before I completely recognized it. Even more intriguing is the gradual realization that you aren't listening to variations of a familiar piece of music but the same exact piece of music played from an entirely different vantage point. Aside from the mixed voice aspect of Souvenir Part I, there's the extremely high quality of the recording. When I first heard hi-rez recordings that cracked the 300kHz barrier (or even the 192kHz barrier), my first observation was how high and extended the treble sounded. Okay, that sounds obvious, but what was even more impressive was the pure and unadulterated sweetness of those high frequencies. As resolution capabilities extend into the stratosphere, I think many audiophiles--especially those who favor tubed amplification that softens the frequency extremes--expect and fear harshness, stridency and brightness. In my experience, this is usually not the case. That said, I had to carefully extend my review period for Souvenir Part I because I was concurrently breaking in a tube amplifier--the Unison Research Simply Italy. When I first listened to this LP on the not-fully-broken-in amp, my ears were pinned back during the full frontal assault of each crescendo. Forget the Loudness Wars; the dynamic swings in this recording are so extreme that you may have to calibrate your volume settings well in advance. If old RCA Shaded Dogs are your reference for outstanding classical recordings--and they are for me--then the 2L sound will definitely shake you out of your warm, fuzzy complacency. Once the Simply Italy broke in, the massed strings were textured and woody and natural, but the crescendos were still bracing--I suspect too much so for a handful of audiophiles. If you love a detailed, informative musical delivery, however, you'll probably adore this LP. Not to lump all of Scandinavia into one frozen pile, but some of my favorite classical recordings come from the Opus3 and BIS labels, and there's a common sonic signature I detect in these northern recordings that vividly convey feelings of loss, isolation and even despair...all of the most winterlike of our emotions. That's not to generalize Scandinavians as dour, depressed souls trudging over snow banks, but it's very easy for me to imagine lonely winter landscapes while listening to Scandinavian composers, conductors and orchestras. 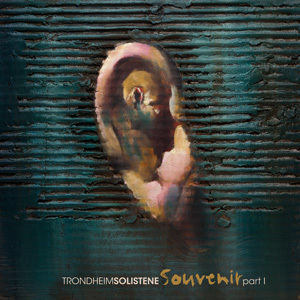 While Souvenir Part I is the epitome of liveliness, there is an undercurrent of austerity and simplicity that adds rather than subtracts and makes this an important release, one that classical music lovers and audiophiles should discover and embrace. For more information on this recording, including how to order it, check out the 2L website. 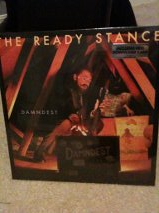 The Ready Stance's Damndest...Now on LP! 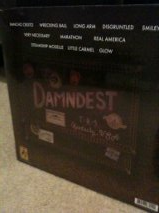 The final LP version of the Ready Stance's new album, Damndest, is finally available on LP from the band's website. As promised, Wesley Pence--guitarist and songwriter for the band--sent me the finished version to match my CD and test pressing--and it's a great package. 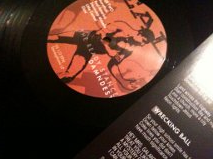 You even get the entire lyrics sheet on the record jacket like the used to do in the old days. Wes's lyrics are one of the many strengths of Damndest, so this is a huge plus. 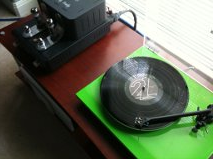 The pressing itself is wonderful; it sounds identical to my test pressing. Surface noise is practically non-existent, so kudos to Wesley and the band for finding the right record pressing plant in France to get the job done. Unfortunately this might remove some of the mystique of test pressings, since there are no real sonic benefits to grabbing one other than the obvious collector's standpoint, but that's extremely good news for reg'lar folks who just want a quality product. As you can see, you also get a free digital download with the LP. My original review is here, so re-read it at your leisure. This is great, great rock and roll, told with honesty, energy and skill. The Simply Italy is going to be one hot little amp, and the Unison factory is already working overtime to fill orders. I got ten of them in today and five went right back out the door to waiting customers. But many of those customers had questions about whether or not this amp could power their speakers. Almost every speaker mentioned was far more efficient than the ARTs. Yet this system here is making music, beautiful music. I started off with "Rise" from the Flobots' Fight with Tools just to see if the Simply Italy and the ARTs could make that gorgeous bass guitar sing, and the answer is an absolute yes. I'm not going to rock out to Tool or System of a Down with this set-up, but the deep bass is solid and the soundstage is hefty and organic. I'm probably going to swap out the ARTs in the next day or so with the far more efficient and far more sizeable Opera Grand Callas, and we'll see what the Simply Italy can really do. But for now I'm pretty pleased with the overall sound of this match-up. When I was into low-powered SET amps (remember that I used a two watt per channel Yamamoto Sound Craft A-08 for a few years), speaker matching was always a question. With two watts per channel, you'd better stick with speakers with efficiencies greater than 96 or 97 dB. I used 101 dB Zu Audio Druids with the A-08 and was very happy for some time. But by the time you get to 10 or 15 watts per channel, you can be surprised what actually works. As long as your room is on the small side (mine is) and you aren't cranking it to 11 (I usually don't) and you aren't using Magnepans, ATCs, Apogees or other hard-to-drive speakers, anything goes. While visiting with Perfect Sound Forever publisher and editor Jason Gross at this year's SXSW, we got to talking about Big Star (as we often do). 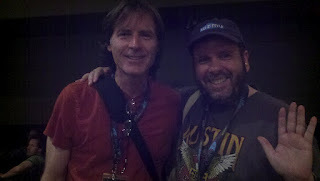 When Jason and I met for the first time in person at 2010's SXSW--I've been writing for him since 1998--Alex Chilton had passed away only a few days before. I then mentioned at our present meeting that Andy Hummel passed away only a few months after that, and now the only original member left is drummer Jody Stephens. "I've heard from so many people that Jody Stephens is one of the nicest guys in the industry," I told Jason. "Oh, he's a sweetheart," Jason replied enthusiastically. "A GREAT guy." "He personally sent me an email once about an Ardent reissue on vinyl," I said. "I plan on saving that email forever." A little while later, after Jason and I said goodbye, I received a text from him that said: "Check your email for a surprise." When I got home, I had to search around--Jason had emailed it to my old AOL account by mistake--but here it is. That's Jason and Jody Stephens from earlier that day. I'm sure Jason was barely suppressing a smile the whole time. Colleen and I have just had the first installment of their "He Said, She Said" column published on Positive Feedback Online! 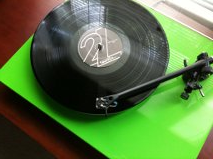 Titled "Pink Turntables on Parade," it discusses high-end audio's attempts to market to women audiophiles: http://www.positive-feedback.com/Issue60/pink.htm. 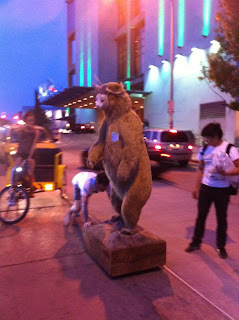 Another SXSW has come and gone. This is my third year in a row of living in the Austin area while the world's largest music festival raged on just a few miles from my home, and as usual I was so disorganized prior to the event that I just drove down, parked my car and just walked around. Every year I say the same thing: next year I'm going to fork out the big bucks and attend the main event. But those big bucks keep getting bigger--this year the SXSW passes cost anywhere between $700 and $1600 depending upon the level of access. I kept hearing from locals who lamented the fact that the first few SXSW festivals cost around $35 to attend. So this year, once again, I played it by ear and was content with just soaking it all in. 6th Street, in particular, was the focus, and I walked around and took in the craziness. 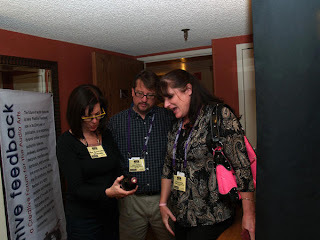 I met with Jason Gross and Robin Cook at the Hilton--Jason is the editor and publisher of Perfect Sound Forever (he has been publishing my Vinyl Anachronist columns since 1998), and he was covering the show for Billboard. I asked him, "So, what was the big event this year?" "Oh," he replied wryly, "Some guy named Springsteen." I started the day off attending the 7th annual BYOC event (that stands for Bring Your Own Chair), which is sponsored in part by my buddy--and Unison Research dealer--Brian Di Frank of Whetstone Audio. Held in the grassy park behind Brian's store, this is a family-themed concert complete with bouncy houses and miscellaneous vendors and has a real cool vibe. Featured acts this year were We Were Evergreen from London, Monsieur Perine from Colombia, Slam Dunk from Canada and Sauti Sol from Kenya. Here's Sauti Sol, a very dynamic band whose sound jumped from soul to reggae to romantic ballads during the course of their set. This was a truly fun band that featured synchronized moves from the musicians that reminded me of Motown's golden age. Later we headed down to the Elephant Room on Congress and spent some time drinking wine and listening a more sedate brand of music. This gentleman was particularly gifted, but because the acts were getting shifted around at the last minute, I had no idea who I was watching. All I could catch was that his name was Matt, and his music was a combination of Americana, jazz and folk. Hopefully I can find out a little more about him; my journalistic skills are becoming rusty. 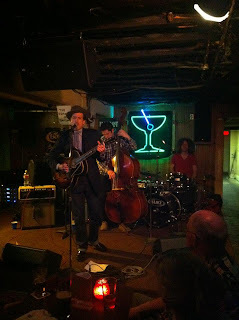 He was a marked departure for the Elephant Room, a venue that usually offers the best jazz in Austin. 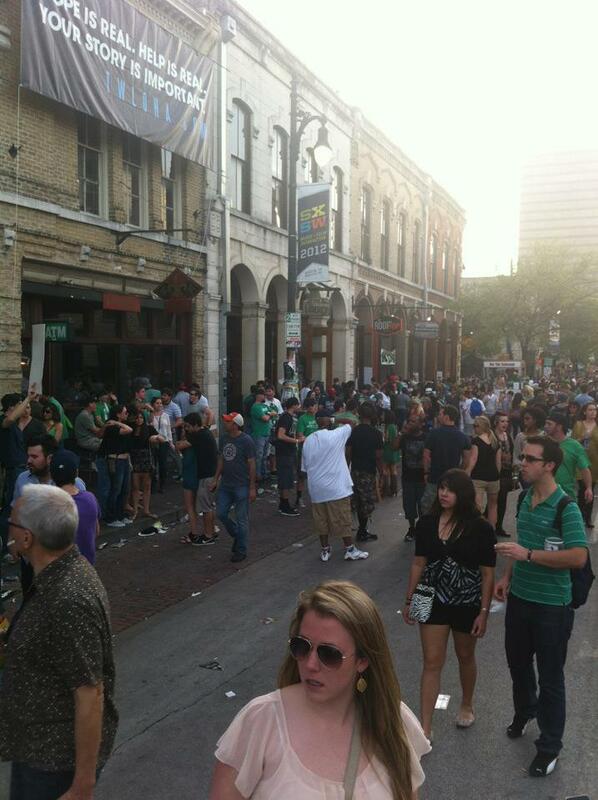 As usual, Austin during SXSW was very entertaining, even more so than usual. It's not every day you see stuffed bears rolling down the street. Next year I promise to be more prepared for the event--as long as I don't have to travel the country in the weeks leading up to the event. After being on the road for a while--nine states in nine days--I finally came home to Central Texas and found a lot of new music in the mailbox. I only have one problem: no system to play it on! That's right--we've been so busy sending out equipment to dealers, reviewers and customers that my own system is decimated. Well, not quite decimated, but I do seem to be lacking an amplifier. 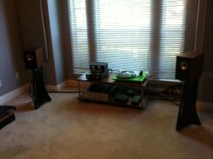 As you can see, I'm down to my old system--Rega P3-24, Lehmann Audio Black Cube SE and my Trenner & Friedl ART monitors. I do have the Unison Research CDE CD player, but that's the only piece of inventory in the house. Most importantly, there's no amp. Unfortunately, that's what I need to listen to music. Fortunately, help is on the way. 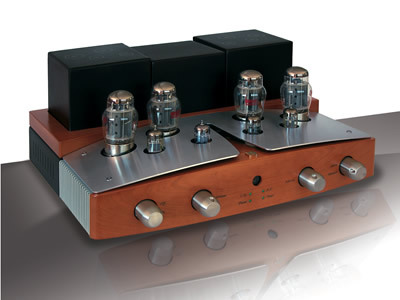 I'll be getting a new Unison Research Sinfonia integrated amplifier from Italy in a few days. 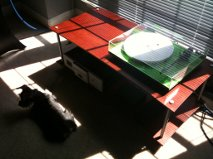 Also, Dave Clark of Positive Feedback Online is getting started on his review of my Giro turntable, so I should have it back pretty soon. (No rush, Dave, but hug the Giro for me!) Within a couple of weeks I should be neck deep in gear again. 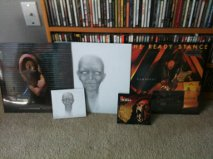 And once I have a complete system again, I'll get started on those CD and LP reviews. Colleen and I visited Fidelis AV, one of the premier hi-fi stores in New England and one of our Unison dealers. Walter Swanbon, the proprietor, is also the US distributor for a couple of my favorite high-end audio brands--Harbeth and LFD--so it was a true pleasure to visit the shop and see how it's done. Fidelis in one of those old-fashioned hi-fi stores with plenty of sound rooms full of great equipment, and quite a bit of floor space is still dedicated to the selling of LPs. In other words, it's my kind of place. In addition, Walter maintains a full sales staff of very knowledgeable people--Jansen, Bill and Dwight--who really enjoy the Unison products and really know how to match them in superb systems. George, one of their regular customers--was also on hand to provide feedback on the various products and to express enthusiasm over such amplifiers as the Unico Seconda and the 14wpc all-tube Preludio. It was the first time Colleen and I were able to truly evaluate these Unison Research products--even though we are the US distributors, the Unison line is extensive and we haven't had a chance to audition every single model they sell...yet! This is the Preludio, which despite being low-powered is still able to create a huge, detailed soundstage with the right pair of loudspeakers. The staff at Fidelis really loves the Preludio with the new, much-admired and futuristic speakers from Vivid Audio. This is the Unico Seconda, a hybrid integrated that offers 100wpc. Compared to the Preludio, it was more dynamic and powerful and had much deeper bass with the Vivids, but the Preludio provided a much warmer and earthy sound that I found very attractive. I'm excited to hear the Preludio since I'm expecting its big brother, the 27wpc Sinfonia, at my house next week. Here's the first system we listened to, complete with a Primare disgital source and the interesting new Stenheim aluminum speakers from Switzerland. (That's Jansen, setting everything up for us.) The Stenheims are sort of a WTF product--they're modest-looking two-way stand-mounted speakers that retail for more than $12K. They may be a tough sell to the uninitiated, but once you hear what they can do, the cost is absolutely justified. Here's another shot of the Stenheims. Don't judge a book by its cover--these are fascinating speakers. Now here's the system with the Vivid Audio speakers. Everyone had the same response to the Vivids, that they are truly strange-looking in an alienesque, '60s retro sort of way, but the sound coming from these speakers was quite incredible. The Vivids weren't exactly cheap at $8K, but I was very impressed with their ability to sound deep, expansive and very musical. 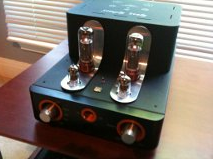 Finally, we did a little tube rolling with the Seconda and replaced the Tung-Sol ECC82s in the preamp section with a pair of NOS RCA "clear top" 12AU7s. Giovanni Saccheti, the designer of the amp, told us that he preferred the Tung-Sols to every other tube on the market, including NOS tubes from Mullard and Telefunken, but these RCAs added a little more depth and warmth to the sound of the Seconda. I'm going to try to find a pair on eBay so I can play around with them at home. Here's a better shot of the RCAs. Here's a shot of one of my favorite speakers of all time, the Harbeth Monitor 40.1s, in the "big" room with conrad-johnson amplification and a Well-Tempered Amadeus turntable. 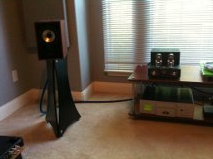 This system also sounded fantastic and reminded me of just how special the Harbeths really are. We wrapped up the afternoon with some wonderful Italian food at the restaurant next door, and we continued our conversation about audio with Jansen, Walter and Dwight while Bill watched the shop. Fidelis is truly a special place, and if you're in southern New Hampshire I strongly recommend that you visit them. Fidelis is located in charming Derry, New Hampshire, and you can visit their website at www.fidelisav.com. I know it's obvious, but Jersey City, New Jersey is worlds away from Central Texas. There's the whole population density issue, which really comes into play when you look for a place to park. Texas is the land of rock star parking, except when you're at SXSW in the middle of March. Suprisingly, however, people in Jersey City say hello to you as they pass you on the street, just like they do in Texas. The accent's just a little bit different. Colleen and I attended our dealer event this past Saturday at the Audio Doctor right in the heart of Jersey City, and it was quite unlike our other dealer events we've held. Dave and Paula Lalin--proprietors of the Audio Doctor and its namesake--works out of their home, but what a home it is. I counted four stories including the basement, and there's a ton of equipment in every nook and cranny. On one level is a state-of-the-art home theater system with rows of seats and a huge projector screen, and other rooms featured entire systems as well as The Rack, a huge fixture that contained a multitude of amplifiers, CD players, DACs and more. CCI was featuring such Unison Research pieces as the S6 and Unico 50 integrated amplifiers as well as the CDE CD player. We had a few noteworthy guests show up such as Stephen Mejias of Stereophile, Steve Guttenberg of CNET and TONEAudio, Michael Trei of Sound and Vision and Laurence Borden of Dagogo. It was a reunion of sorts for Dave, Steve, Michael and Paula, who all worked at Sound By Singer in Manhattan at one time or another. Dave and Paula have created a truly unique audio store in thier home and carry a huge variety of brands at the Audio Doctor. If you'd like to come visit them, give them a call at 877- 4AV CURE or email them at sales@audiodoctor.com. You can also check out their website at www.audiodoctor.com.